Designed primarily for domestic use, the Carrier combines rugged build quality with optimum carrying capacity. Extremely practical and durable, the Carrier weighs only 100kg and is yet capable of carrying a payload of 400kg. The carrier practically doubles the avilable load space of a typical family car. Most importantly, by using a Carrier, it is possible to transport bulky or unclean items that would not normally be carried within the car. 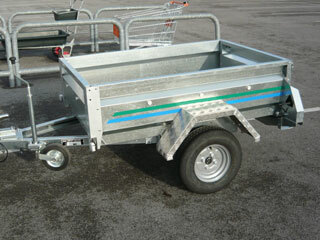 Conway Carriers have also developed a trailer which includes a Tilt frame, red cover and a tail gate ramp. This is a carrier special which was built for a disabled person in mind to transport their mobile scooter. Full beam axle with hubs and taper roller bearings for a safe, smooth ride. 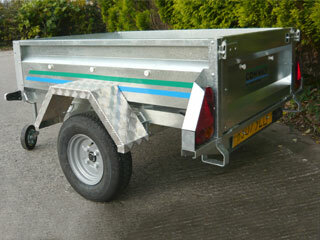 Formed galvanised steel body to give strength and rigidity. Unbeatable deep body for optimum carrying capacity. Phenolic plywood floor - waterproof, scratch resistant, will not rust. Full road lighting in a protective channel. Stands on end for easy storage. 10" wheels for better road holding and less tyre wear. Easily towed by most cars. 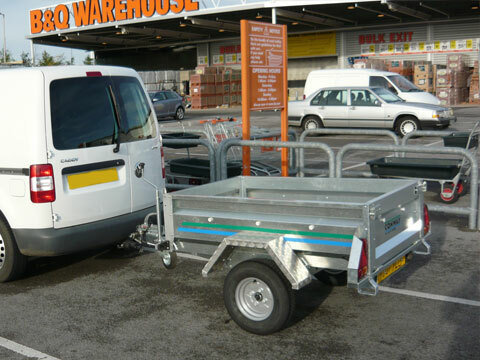 Easy to fit optional extras, high covers, ladder racks. 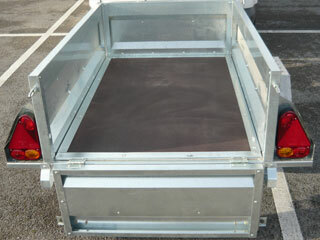 'A' frame drawbar for greater rigidity.